Please feel free to contribute to this frequently-updated forum, which posts selected commentary on our favorite comic strip. If you'd like your critique to be posted, please note that civility, if not approbation, counts. Click here to submit a comment. R.I.P., Widow Doonesbury a.k.a "Bodacious Granny D."
Outstanding storyline! We recently buried Mom. It was awkward and awful. The minister went on about how "she loved life." The boys (adult brothers) sat around and compared beatings, as in who got the worse one ever. I think I won. But she could screw with your head. That turned a simple beating into a torture session where your whole existence was questioned. And invalidated. Her illnesses ate up all the inheritance. In the end, we were there for the funeral. I hadn't spoken to her since Dad died. I didn't have anything to say at the funeral, either. A simple paupers coffin. No memorial service, just a box. Just a hole in the ground. We're all comparing beatings and mind-farks, to see which one was the most devastating. As we left, my wife said, "You know, they all looked relieved she was dead." I had noticed the brothers wives looked relieved. There were even quiet admissions that she scared them, too. So yeah. Good call. Ha! Great strip today -- once again. GBT continues to go where no comic has gone before. I'm just waiting now for the old rascal to sit up in her coffin and give Benjy an earful for not visiting. Well done! I like the direction on today's strip: Son out of touch with deceased older parent and family dynamic -- sign of the times. Keep it up. I wonder why Julian Assange is posing as Benjy Doonesbury in the strip today. Oddly, my favorite part of today's strip is the first two panels, which don't even appear in my newspaper. Also, watching Leo's expression in each frame. Keep up the good work, GBT. And 40: A Doonesbury Retrospective is AMAZING! Nice work in support of our young vets. There's still some class and intelligence to be found on the planet. My wife is a minister. Those who found the Christmas strip offensive ought to hear what ministers say to each other in private. About the Christmas strip and shouting at God: yes and no. Shouting "How Long, O Lord?" is Advent. But Christmas about "Here I am!" And then Easter is about God being totally in it with us; at that point one doesn't feel like shouting at him any more. But I do congratulate you for being genuine rather than glib about the subject. "How long, oh Lord" is the most repeated and venerable cry in the Bible. If God isn't big enough to yell at, well, that's not much of a God, is it? The Christmas strip was spot on. I come from a long line of clergy persons, and am an elder myself. We all of us yell at God. At least he knows we care. Keep up the good work. As an atheist who doesn't believe the military should even have sky-pilots, I think the strip's portrayal of chaplains and their work has been exemplary. Sometimes it gives me a creeper (that's when you kind of start to cry but don't actually). "He deserves it, in my humble opinion." The VA counselor's comment reveals a view of God that is both narrow-minded and shallow. The only reason this offended Christian doesn't chuck Doonesbury out of his life immediately is that Mr. Trudeau is an equal-opportunity offender. 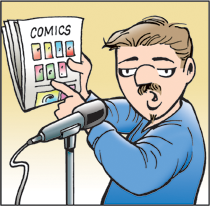 Sooner or later, Doonesbury offends everybody. I am not a sentimental fool. I know that in a few years, when Toggle and Alex are no longer starry-eyed lovers, they are going to want to change something about each other. But reading today's cartoon made me say 'awwwwww! ', and remember those days of blind, unadultrated, pure love! Oh, and as for your Christmas comic -- even the most ardent believers have their moments when they scream and curse the way some things are. It's what people do in real life. Why shouldn't they do so in a comic strip? I'm a priest in the Church of England and one of my closest friends is a military chaplain. The chaplain in your strip is one of the most honest and positive representations of ministry that I have seen. I hope you will eventually do a book that includes all of the strips with this character, as I would very much like to be able to give it to other military chaplains that I know. Many thanks for all your work. The Christmas Day strip was outstanding. Given that it's the Prince of Peace's birthday, taking a stance on the war is pretty great. Nice interview on the Newshour -- although I think GBT was being too humble when he described himself as a "short order storyteller." It takes some serious chops to juggle so many characters and storylines, and to pull it off with such style. Thanks for forty years of awesome comic strips. I can't wait to see what happens next. It was a Doonesbury Christmas at our house this year! As I gave my sister-in-law her present, she exclaimed at how heavy the unwrapped gift was. She squealed with delight upon unwrapping it and then proudly held aloft for all to see: 40: A Doonesbury Retrospective. I have never seen her happier. Moments later I handed my mother her present and she also exclaimed at her present's heft. With a knowing look in her eye, she happily peeled off the wrapping paper and chortled with glee over her own copy of 40: A Doonesbury Retrospective. My father then put on his coat and went out to his car, returning moments later with a smile and a very-familiar-weighing gift for me. Needless to say, my sister-in-law, my mother and I all received what was at the top of our Christmas "Wish List"! Thanks GBT for 40 (and counting) wonderful, wonderful years of humor and social commentary. May you keep on creating ad infinitum. Happy Holidays!